Skywatcher Rob Bullen of Forest of Dean, Gloucestershire, England caught this snapshot of shuttle Discovery (left) as it approached the International Space Staiton on Feb. 26, 2011. Discovery was flying its final mission, STS-133. NEW YORK – Amateur astronomers around the world have caught amazing views of NASA's space shuttle Discovery in the night sky, and skywatchers have one more chance tonight to try and spot the spacecraft before it lands. Discovery is flying its final mission before being retired for good and is due to land tomorrow (March 9) in Florida. So tonight is likely the last chance to see Discovery in space with your own eyes before it returns to Earth and is sent to a museum. Amateur astronomer Tony Hoffman of New York City took this long-exposure photo of the shuttle Discovery (right light line) and International Space Station as they flew over Flushing Meadows Park in Queens, NY on March 7, 2011 during the STS-133 mission, Discovery's last flight. Hoffman ventured out to Flushing Meadows Park last night to catch Discovery and the International Space Station as they flew in formation above the city at about 6:57 p.m. EST. If you're unfamiliar with the location, it was the site of the 1964/1965 World's Fair and is home to the Unisphere (a globe-like sculpture surrounded by fountains). The gleaming metal Unisphere, alas, was too bright, but Hoffman was still able to catch a snapshot of Discovery and the space station soaring 220 miles (354 kilometers) overhead. In his long exposure, they appear as two bright lines – Discovery ahead of the station – as they flew across the sky. For Hoffman, these views of Discovery are especially poignant. He watched Discovery launch on its final mission on Feb. 24. "I'd been down to Florida for Discovery's launch 10 days ago, so it seemed like a completion of sorts, and a beautiful way to say farewell to this amazing craft," Hoffman said. "It was good to see the two craft together, one of the last times anyone will get to see the sight, and there's a bit of sadness in that realization." Discovery is due to land at NASA's Kennedy Space Center in Cape Canaveral, Fla., at 11:58 a.m. EST (1458 GMT) tomorrow. The shuttle delivered a new storage room and humanoid robot to the space station on NASA's STS-133 mission, the final flight of shuttle Discovery before it retires. Unlike Hoffman, I was nowhere near a wide open space like a park when it came time for Discovery and the station to fly over New York City. I was in Manhattan and had to time my walk from SPACE.com's home office on the ninth floor of a Park Avenue South building to Penn Station in the hope of reaching the intersection of Madison Avenue and 31st Street – an intersection that has the biggest patch of sky in the concrete canyon that is my walking commute to the train station. I got there a few minutes early, uncertain where to look between Manhattan's skyscrapers to catch Discovery and the space station, which were going to appear about 50 degrees above the horizon in the north-northwest. Normally that would be an easy flyover to spot, but in Manhattan – where skyscrapers obscure the views of the horizon on all sides – you only get a short time to spot spacecraft flyovers before they're lost behind buildings. At 6:57 p.m. EST, I looked up. Nothing. "I'm not going to get to see it," I thought. But then a dazzling bright light winked into existence from behind a building on the northwest side of Madison Avenue. There was a red light and several New Yorkers were waiting to cross Madison and giving me odd looks for staring up. "That bright light there is the space shuttle Discovery, there's six people on it right now. It's flying its last flight and coming home Wednesday," I told them. Just then, another bright light popped up – the International Space Station. "And that's the International Space Station." We all watched for awhile, then the light changed and my companions crossed the street. Discovery and the shuttle passed behind a skyscraper, but a quick jog across the street brought them back into view. My cell phone camera isn't great at night sky photos, but I tried anyway – just in case. Discovery was the first space shuttle I ever watched launch into space in person, so it was nice to catch a glimpse of its final flight as well. I looked at my phone: 7:01 p.m. EST, just enough time to catch the 7:16 p.m. train home. Hoffman and I are just two skywatchers who caught amazing views of Discovery and the International Space Station from the Earth. At least two other astronomers have snapped amazing photos of Discovery either arriving at the space station, or linked to the orbiting laboratory. "After a very cloudy day the skies cleared about an hour prior to the ISS pass. I knew Discovery was going to be closing in on the station but had no idea just how close to docking it would actually be," Bullen told SPACE.com. Tracking two spacecraft flying in formation hundreds of miles above Earth – and at a speed of about 17,500 mph (28,163 kph) is not easy. Experienced amateur astronomers with telescopes or high-power cameras are needed. "It's a tricky task and you regularly end up with nothing or shots with a lot of motion blur. Just every so often you get something useable and on this night, only after reviewing the images, I saw the shuttle drifting next to the station," Bullen said. "To say I was stunned was an understatement as it's taken me many years of failed attempts to get a clear image of a shuttle." Skywatcher Martin Lewis of St. Albans, Herts in the U.K. caught this amazing view of the docked shuttle Discovery and International Space Station on March 2, 2011 during a spacewalk. A spacewalker can be seen on a robot arm. Lewis' photo shows the docked shuttle and space station on March 2 during the second spacewalk of Discovery's mission. 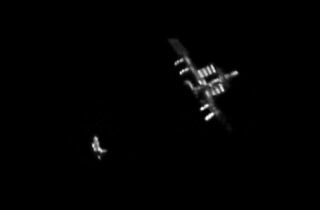 If you look closely, you can see an astronaut at the end of one to the robotic arms on the two spacecraft – but he's not where Lewis initially thought. "I took it through my homebuilt 8 3/4-inch reflector from my back garden in St Albans and the telescope was hand-guided to follow the path of the ISS as it rose in the west and passed overhead," Lewis told the Society of Popular Astronomy. "The astronauts were 3hr 30min into a 6hr 30min EVA at the time I took my shot and part of this EVA involved Steve Bowen riding the Shuttle’s Canadarm." In an initial annotated image, Lewis indicated that Bowen was on a robotic arm that can clearly be seen to the left of Discovery in the photo. But a subsequent analysis has identified that as Discovery's robotic arm, not the space station's Canadarm2 that Bowen was riding on, Society officials explained. "Martin Lewis who took the photo has analyzed it further with a Dutch colleague who takes similar photos, and they conclude that the astronaut is in the picture but on the other side of the shuttle," Society spokesman Paul Sutherland told SPACE.com in an e-mail. New annotations were made and the photo re-released. How can YOU see Discovery tonight? Each will ask for your zip code or city, and respond with a list of suggested spotting times. Predictions computed a few days ahead of time are usually accurate within a few minutes, according to SPACE.com's skywatching columnist Joe Rao. Another great site is this one, which provides real-time satellite tracking and shows you at any given moment during the day or nightthe part of the Earth the space station or shuttle happens to be over, Rao advised. When Discovery lands tomorrow, it will end the shuttle's 27-year spaceflight career. This is Discovery's 39th and final mission to space. Discovery's first spaceflight was in 1984. Its next stop after landing this final mission will be a museum for public display. NASA is retiring its 30-year space shuttle program this year to make way for a new space exploration program aimed at sending astronauts to an asteroid. Only two more shuttle missions are planned (one each for shuttles Endeavour and Atlantis) before NASA's orbiter fleet hangs up its wings for good. For Bullen, as with Hoffman and I, a chance to see the shuttle fly overhead one final time – and even snap a photo – was not to be missed. "With only two flights left, I may never get the chance to see let alone image a space shuttle as the viewing conditions may not be so favourable next time so I feel very lucky that everything came together (with a lot of luck) to allow me to capture this image," Bullen said.